Let me state now that it is best to go as large as the area you plan on placing the tank will accommodate, as size does add one significant benefit, stability. The greater the volume the longer it takes to alter it. This applies to many things, mainly water quality and temperature. 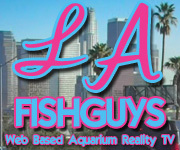 I would not recommend setting up a saltwater fish tank smaller than 55 / 60 gallons. Why, for two reasons; the above mentioned reason, the lack stability in a small tank changes too fast, and the cost to set up a smaller tank with the proper equipment and livestock is almost as much as it would be for the larger tank. Think about it, what do you do with your equipment when you have successfully completed your smaller fish tank and decide you want to go bigger ? This is not to say that you cant have a small fish tank and move its equipment over to a larger tank at a later time, but chances are you may not be as successful with the smaller aquarium thus leading to not perusing the larger tank. There are a wide variety of tanks and they come in many sizes, shapes and types of materials. Most Fish Shops will carry a line of standard size tanks ranging from 10 gallons up to 100 gallons, in shapes from rectangular, square, hexagon to oblong. Tanks in the past use to made from Glass, but Acrylic tanks now seem to be the trend. Glass tanks use silicone to join their edges, whereas Acrylic tanks use a solvent that bonds the pieces of acrylic together giving the tank a stronger joint. From the maintenance standpoint a glass tank is easier to clean, especially the calcareous algae’s that can quickly grow in a Reef Tank. Acrylic tanks can scratch very easily, and are generally scratched when cleaning the glass down near the bottom of the tank, or from objects falling inside the aquarium. On the other hand you can polish out most scratches in an acrylic tank, whereas a glass tank is much more difficult to remove scratches. Before I go any further let me briefly define the two most commonly used methods of filtration used in a marine aquarium; the Undergravel in combination with a Canister filter, or the external Wet Dry Trickle filters ( see Filtration Approaches ). Undergravel and Canister filters have been around for 30 years. They work quite well and are installed quite easily. Wet Dry Trickle filters may be more complicated in their plumbing needs but they offer much greater effectiveness in their ability. Probably the best reason for selecting an acrylic tank is that you can drill holes into it easily. Why would you want to drill into a tank ? , If you don’t want to see all of your plumbing’s inlet and outlet pipes climbing over the back top edge, then you might want to plumb those items through the back or bottom of the tank. NOTE: If you are drilling your plumbing through the bottom, or back, of the tank as an return, then you must incorporate a Check Valve into its plumbing. A Check Valve is a one-way valve that prevents water from leaving the tank when the power is turned off. Keep in mind that these Check Valves are not a fail-safe and they do require maintenance and attention. Another very good reason for selecting an Acrylic tank is you can have an Internal Overflow Box added to it for the Wet Dry Trickle filter. What is an Internal Overflow Box ? In all aquariums various organic compounds, proteins and enzymes tend to collect at the surface of the water. These compounds form a skin which inhibits the exchange of gases such as carbon dioxide and oxygen from transferring between the water and the atmosphere. 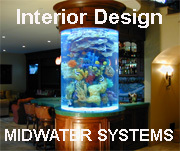 An Overflow system is a box or pipe placed in the corner or middle of the back of the aquarium. It can either rise up from the bottom or elbow upwards from the rear of the tank. The Over Flow allows the water at the surface to drop off into, or be skimmed from the surface, thus removing this layer of organic skin and allowing the tank to breathe. The Overflows water is then routed out of the bottom of the Overflow and down into the Wet Dry Trickle filter system. 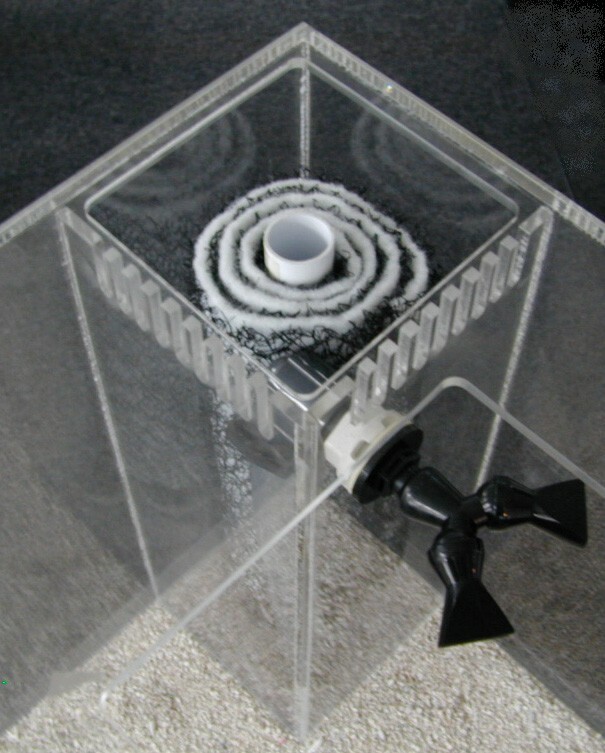 AQUARIUM-DESIGN.COM offers this as an optional Overflow Pre-Filter Package which includes the holes drilled for the exit and return assemblies. For the Undergravel and Canister filter approach acrylic tanks have long narrow slots across the top, back edge of the tank to accommodate the inlet and outlets of canister filter, power filter, airlines and power cords. Should you decide on a glass tank, or have an existing glass tank, and do not want to have holes drilled into it there are External Over Flow systems available. These units consist of a surface skimmer box that sits down into the water allowing the surface water to be drawn off. As the water fills the skimmer box this External unit uses siphon tubes to draw the skimmed water out of the box, and then routes it over the edge of the tank and into a prefilter box that hangs on the back of the aquarium. Both the Internal and External Over Flows allow the waters organic skin layer to be drawn off, but the External requires much more attention and maintenance. The reason for this is the Siphon Tubes which are prone to filling with air, thus either affecting the overall flow of water, all the way down to the return pump, or simply no longer siphoning ! Within the Overflow Box, or External Overflow, one places a filter media, such as a spiral filter pad, to separate or trap out the large pieces of debri's that are drawn into the overflow system. This 'pre-filter' media is your first type of filtration and it is called mechanical filtration. Mechanical filtration is simply a media that traps out particles but lets the water pass through. It is important to remember that this pre-filter needs to be cleaned or replaced in time. For the Undergravel and Canister filter approach glass tanks have a long plastic strip at the top back edge of the tank that is easily trimmed to accommodate the inlet and outlets of canister filter, power filter, airline and power cords. As I mentioned in the beginning of this article, the first step in building a good fish tank is to THINK about its design. Hopefully this and future articles in this series will help you to achieve that, but ultimately the reason for success is YOU and the effort that is put into it.